Our story today comes out of Bermuda reported by the Royal Gazette where two separate attempted handbag thefts got these women fighting back. The full story can be found here. Two women refused to be victims and fought back when men attempted to steal their handbags. 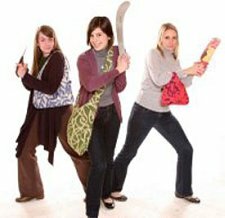 In two separate incidents on Tuesday, handbag snatchers were chased and fought by their targets. In one case, the victim lost a pouch containing money, but in the other a 28-year-old forced the would-be thief to give up and retreat. At around 11.20 p.m. a 28-year-old Pembroke woman was walking along Serpentine Road, in Pembroke, when a dark skinned male with fuzzy white hair grabbed her handbag and began to walk to a parked bike. The woman then fought with the thief, grabbing the handbag back and screaming until he turned tail and escaped on a motorcycle. The suspect is estimated to be around 55-years-old and 5ft 6in, and was riding a green Honda Lead motorcycle. Earlier the same day, a 35-year-old tourist was riding her rental cycle along Somerset Road around 3.40 p.m. on Tuesday when two men on a yellow motorcycle pulled alongside her. The Police spokesman said: “The pillion passenger on the yellow motorcycle then grabbed the visitors brown handbag out of the rental cycle’s basket. The thieves dropped the handbag after removing a gold coloured pouch, which contained cash. After the incident, the motorcycle used by the thieves was impounded, and an 18-year-old Sandys man was arrested in connection to the crime.